On October 24th I took my first deer with traditional equipment. Shot was about 5 yards and she did not make it 50 yards. 1976 bear super kodiak (dads old bow) 55lbs, WW broadhead. 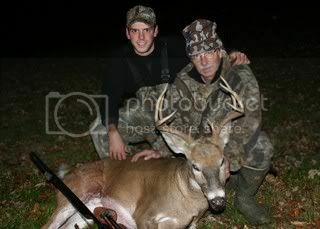 On November 4th dad took a nice 8 pointer (one i had watched all morning). 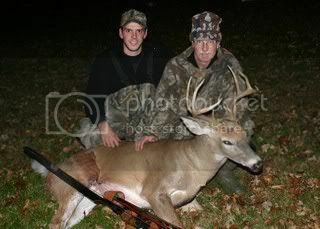 Shot was about 13 yards, hit the heart but took deer 15 minutes to expire. 1970 bear super kodiak, 70lbs, zwicky eskimo 2 blade head. Congrats on your first. Way to go!! !